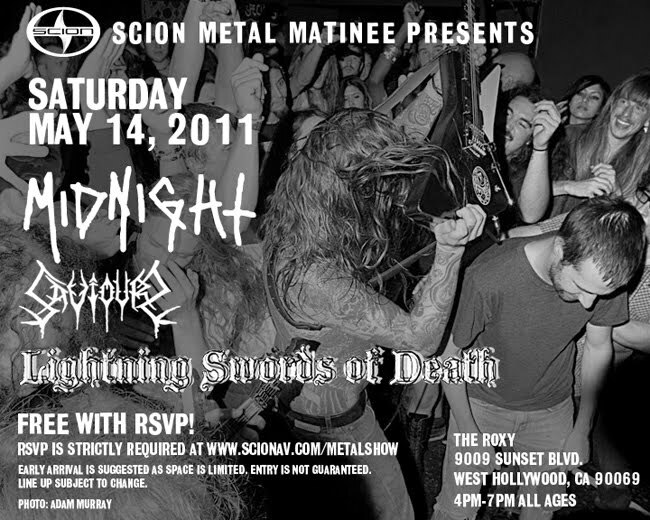 Cerebral Metalhead: GO: Midnight/Saviours/Lightning Swords of Death, 5/14/11 @ The Roxy in L.A.
How about we pretend that it hasn't been five months since I've posted. Agreed? Agreed. Day jobs and paid writing work and girlfriends take precedence. And I've been listening mostly to jazz in my free time, which means that metal has taken a backseat. Gotta admit -- after a few weeks straight of Coltrane, Miles, Monk, Mingus, Bill Evans, Joe Henderson and Brad Mehldau, the new Izegrim and Hyperborean records sound pretty aces. Call it Joni Mitchell syndrome. Ya don't know what you got 'til it's gone. I'm happy metal is back in my life. More than any record though, I've missed going to metal shows over the last couple months. That's why I'm looking forward to Scion's next free metal matinee, coming up this Saturday at the Roxy in L.A. And also why I'm going to insist that you join me. 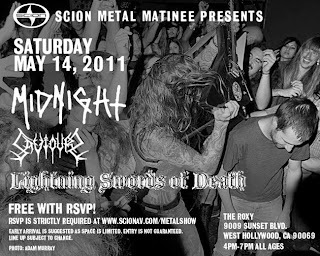 Midnight, Saviours and Lightning Swords of Death are all on their "7 Days of Plague" west coast tour. The whole shebang is presented by the good gents at OvrCast and City of Devils but Scion's footing the bill for this particular show (tourmates Archons will sadly not be joining them on stage for this particular stop). It's a perfectly curated lineup, presenting three very different styles that oughta balance out like the ideal imperial IPA, brutally bitter but loaded with the sweet stuff too. Saviours (reviewed here) will provide the riffy hesher fodder. LSOD (reviewed here) will provide the soot-choked atmosphere. If there is a pit (Scion's metal matinees aren't known for 'em) then Midnight will be its genesis. Featuring Jamie Walters of Toxic Holocaust/Nunslaughter fame, Midnight's all off-the-rails blackened punk. All of these guys are road dogs so the sets oughta be tight, or at least loose in that tight way that only a great punk-metal band can do..
As with all Scion shows, this one's free. But you must RSVP here. See you in the pit. "Featuring Jamie Walters of BOULDER fame." Fixed. So how was the show? Love the line-up. LSOD is killer, but after three or four songs it start to blur together for me... wondering how they are live.